There are two methods used for deworming horses. The first method is to administer paste dewormers every 10-12 weeks. The second method is to keep the horse on a daily dewormer and paste deworm twice a year. ENSURE YOU READ THE INSTRUCTIONS ON PRODUCT AND DOSE ACCORDING TO SIZE OF FOAL. Moxidectin (quest) is not recommended in foals less than 4 months of age. Rotation between classes of dewormer is recommended to prevent resistance. Your horse should be dewormed minimum two times a year, once in the spring, and again in the fall after first frost. Routine fecals should be sent to your veterinarian deworming AND 10-14 days after you have dewormed your horse. This gives the dewormer time to kill off the worm load in your horse and allow us to tell what types of worms and how many are still left. Young horses under a year of age should be dewormed more frequently to prevent roundworm proliferation. Remember, these are strictly GUIDELINES, please work closely with your veterinarian to ensure your horse is getting the best protection possible. **Remember to read the active ingredient. For example fenbendazole is the active ingredient in Panacur and Safeguard. 2. Daily Deworming Protocol- This is only recommended with the advice of a veterinarian, please talk to us about your specific deworming needs for each individual horse. Deworm December and June with Ivermectin/praziquantel combination(Equimax) and keep horse on a daily dewormer, pyrantel pamoate (Strongid 2 x). If you choose this protocol, we recommend enrolling in the Preventicare Program offered by Pfizer. Note* Before starting the continuous deworming program, deworm with Equimax, Quest or a Panacur Power Pac. This is a very owner intense program and is only suitable for a few horses, please contact us about your specific needs before enrolling in this program. Tyler Bennett came to Alberta vet centre on Saturday November 23rd with his weanling foal named Shania because she started acting colicy and frothing from the mouth. Upon examination and tubing, Shania began refluxing roundworms out of her nose and mouth. Dr Marcos Lores realized the severity of her situation and let Tyler know she needed emergency surgery ASAP to save her life. Dr. Marcos informed the client that Shania?s body was overrun with worms, releasing toxins into her body, blocking her intestinal tract and shutting down her organs. <?xml:namespace prefix = v ns = "urn:schemas-microsoft-com:vml"> The Bennetts were confused, because Shania looked well, not thin, and they have a deworming protocol on their farm and had recently dewormed all of their horses. Unfortunatly, many parasites have become ?resistant? to many of the dewormers we frequently use today, hence it is so important to do routine fecals on your horse and work closely with your veterinarian to come up with a deworming protocol that fits the lifestyle and environment of your farm. Shania was rushed into surgery around 1:30pm on Saturday and her surgery was finished on 6:00pm. 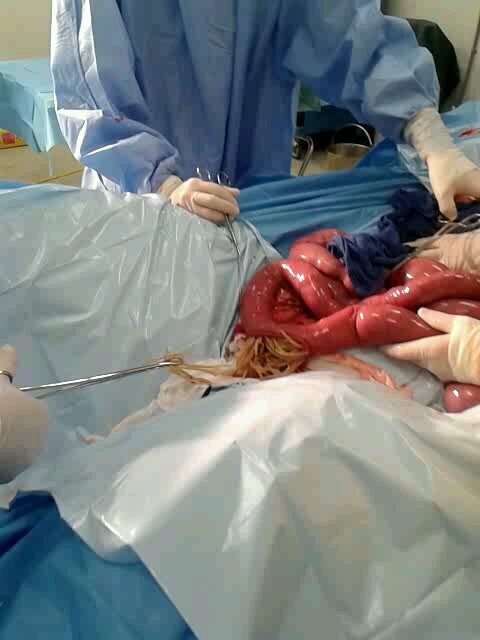 Dr Lores made two incisions into her intestine and removed numerous worms. She had made it through surgery, but her long road to recovery had just begun. After a tough week at the clinic with intensive care and aggressive iv fluids, Shania was sent home on Saturday December 1st! 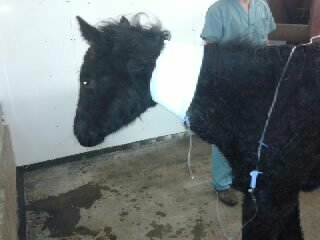 With this type of diagnosis and surgery, adhesions are common and Shania may colic again. Shania is continuing to do well at home, but will be carefully monitored for the following months to come.